Breakfast for dinner. Dinner for breakfast. Either application works with this Breakfast Lasagna. 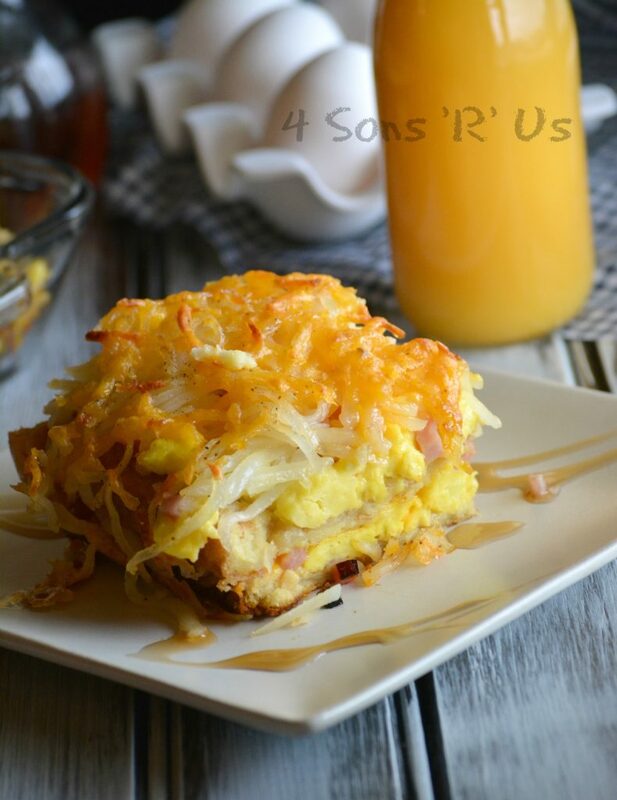 Fluffy scrambled eggs and diced ham are sandwiched between layers of French toast with a syrup drizzle and a crispy hash brown crust. Day or night– it’s a hearty meal that’s sure to please any crowd. Everything has a flip side. For example– when my husband and I first met he was more the cook than I was. Not that I wasn’t capable, he was just the one who assumed that responsibility and did it. Then I quit working to stay home with our kids and that responsibility gradually shifted to me. Except I’m not a morning person, or a breakfast person even on those mornings I am grudgingly awake at an early hour. I was ecstatic when my husband took on the job of Saturday and Sunday brunch maker as a result. To this day every Saturday and Sunday morning he gets up, letting me sleep in, brings me coffee in bed, and gets to cooking. Usually it’s some combination of breakfast style meat like sausage or bacon, and whatever style of eggs he’s craving. Occasionally he mixes things up with pancakes or waffles. At this point yo’re probably wondering what the flip side of all this is. The catch is that because of that he really dislikes having eggs or any type of breakfast food for any other meal. Like dinner. As if I’d let something like that rain on my ‘breakfast is an acceptable meal any time of day’ parade. So breakfast lasagna for dinner last week is what he got. Despite his protests and annoyance. And you know what– against his better judgement he ate it, for dinner, and liked it. He even discovered the sweet goodness that’s syrup drizzled over his scrambled eggs. 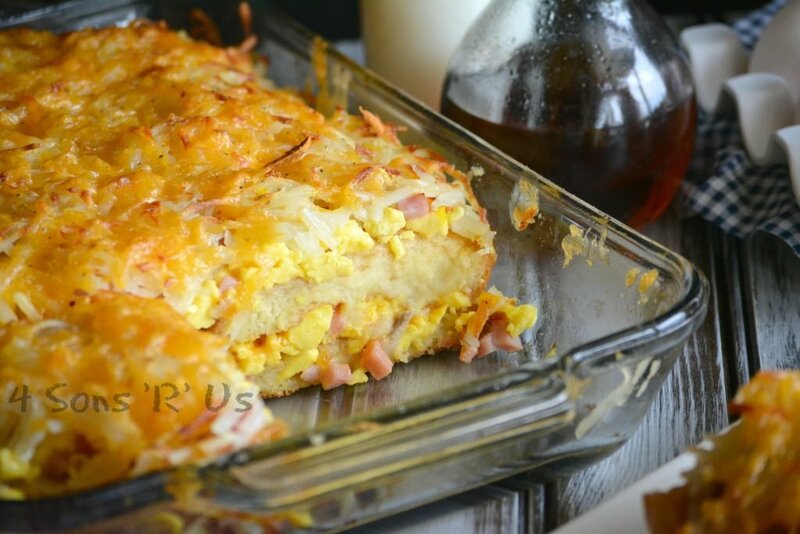 An easy breakfast casserole that's perfect for breakfast or dinner, and filling enough for a family meal or a weekend brunch. Crack the eggs into a large bowl. Pour in a tablespoon or two of cream and use a whisk to whip them together until frothy and evenly incorporated. Cook the eggs in a large, non stick skillet over medium heat. Stir them occasionally to prevent sticking and break them up into rough chunks as they're cooked. Remove the cooked eggs from heat and set aside. Spray a 9x13" baking dish with non stick cooking spray. Place 6 slices of french toast into the bottom of the dish-- in two rows of three each. Drizzle syrup lightly over top. Spread half of the cooked eggs evenly out over top, followed by half of the diced ham, and finally 1/2 cup of the cheddar cheese. Repeat the layer once more beginning again with the slices of french toast. 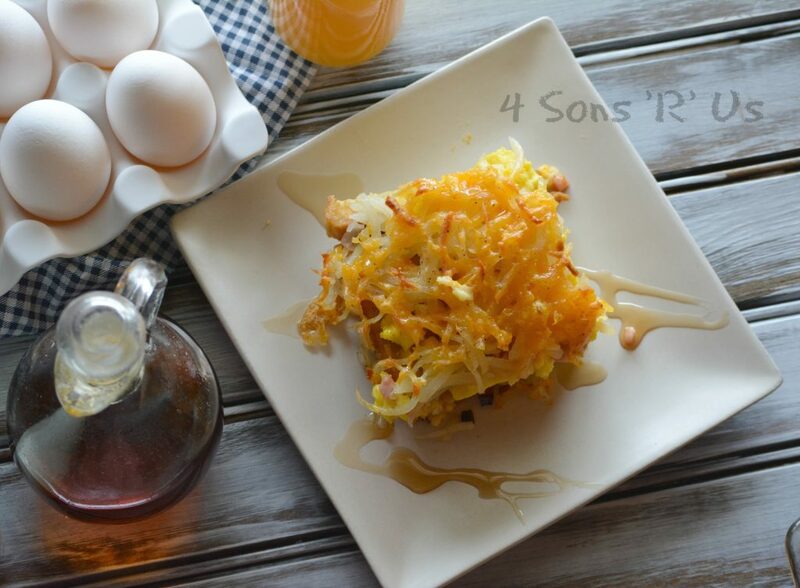 Spread the hash browns out evenly between several layers of paper towels, pressing them to remove any excess moisture. 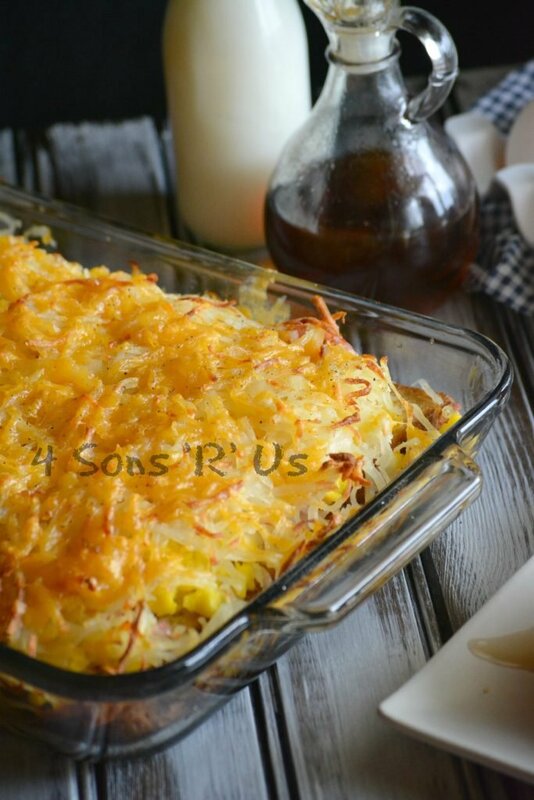 Top the casserole with the hash browns and spread them out evenly over top into a thin layer. Salt and pepper them to taste, before drizzling them with olive oil. Bake at 350 degrees for 30-35 minutes. Remove the lasagna from the oven and sprinkle the remaining half cup of cheddar evenly out over top. Return the dish to the oven and bake for another 5 minutes or until the cheese is melted and the crust nicely crisped. Let the dish rest for a minute or two before slicing and serving. Drizzle with additional syrup, if desired. Ha! That is too funny! I love breakfast for dinner. Mostly because I love breakfast foods but am not a huge breakfast eater. My husband could usually do without, but indulges by breakfast food needs every once in a while. Now if I could just get him to figure out this whole coffee in bed on the weekends thing…. Coffee in bed is such a magical thing. It will probably make for an even better weekend for him in return. #happywifehappylife right?? Oh, My! Perfection!! I can’t wait for a crowd so I can make this! This is perfect for serving a crowd, especially since it’s so easy to throw another pan together– even at the last minute. It should freeze just fine, Cindy. I would freeze it after assembling, but before baking and of course wrap it up/seal it tightly. When you’re ready to use, let it defrost to room temperature before proceeding with the directions and baking. it’s in the oven now, instead of ham I used cooked crumbled sausage. hoping for the best. thanks for the recipe! Does the French toast need to be frozen? No, it doesn’t have to be Arlene. Fresh, frozen, or defrosted all work. The only difference I’ve noticed is that when cooked from frozen it is thicker than it otherwise would be– but just as yummy. I feeding 100 and my bread doesn’t fill in all of the gaps. Will that still work? Does it stick to the bottom of the pan? Thanks so much for helping me tweek this. I don’t think you can plug them 100%, but for the inevitable gaps at one end of the pan since the bread’s not exact– I tore another piece in half and filled in as needed 🙂 No problem! I know y’all will love it! I’d do a light layer of non stick spray just to be safe and again little gaps here and there are fine, I’d just try to avoid any holes by filling in as needed with extra french toast. Can this be made the night before and put in the fridge?